Sierra Gregg of Kirkwood, a senior at Missouri’s Truman State University who is legally blind, proves that hard work, dedication and belief in a cause can overcome all limitations. Sierra discovered in 2011 that almost all of archived documents about the Americans with Disabilities Act of 1990 (ADA) on the ADA website for the Presidential Libraries & Museums at the National Archives in Washington, D.C., were not digitized. Dismayed, Sierra began a project to convert more than 50 archived ADA documents on the website into digital formats, which are more accessible to readers with limited vision. Sierra, now age 21, spent the past two summers in Washington, D.C., leading that effort as an intern at the Presidential Libraries. Sierra’s initiative earned White House recognition. Sierra was born with a rare birth defect that left her legally blind. Raised in St. Louis, she became involved with the Lighthouse for the Blind – Saint Louis. Sierra attended the Lighthouse Summer Transition Employment program (STEP), and later earned two scholarships through the Lighthouse Continuing Education program. The scholarships covered housing costs for a summer internship in the nation’s capitol. Sierra quickly adapted to her new position of writing and researching content to post on the social media pages for the Presidential Libraries. Midway through summer, Sierra decided to write a post about a topic near and dear to her: The Americans with Disabilities Act of 1990. While researching the act, Sierra discovered that only two of the archived documents on the ADA website were digitized (Digitized documents are more accessible to readers with limited vision.) Sierra also was disappointed to learn that most official records and manuscripts documenting the history of people with disabilities were not accessible to her or others with visual impairments. She seized the opportunity to make a positive difference. Sierra spent the remainder of her summer developing a proposal to convert archived documents on the ADA website into digital documents. “Without scholarships from Lighthouse for the Blind-Saint Louis, I would not have been able to have internships in Washington, D.C.,” she asserts. This past summer, Sierra worked with several special interest groups and representatives at the National Archives to make her proposal a reality. On July 26, 2012, the 22nd anniversary of the signing of the ADA, the National Archives launched Sierra’s new web page embedded within the ADA website containing 56 newly digitized documents. These records include letters written by Helen Keller to President Herbert Hoover () and a Braille letter written to President Dwight D. Eisenhower by John Beaulieu. 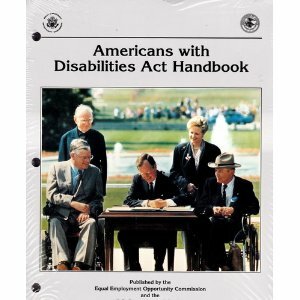 The ADA was signed into law by President George H.W. Bush in 1990. The ground-breaking law mandated universal accessibility to Americans who are disabled. The White House wrote about Sierra’s achievement on its blog. Sierra, who attended Ursuline Academy when she was growing up, plans to attend graduate school upon earning her Computer Science major degree at Truman State University. She dreams of working in a major library where she can continue her work to help make literature and documents more accessible to those who are visually impaired.